I heard about Icebox Cafe on South Beach from a friend of mine. I checked out their website and when I discovered that the dessert menu is larger than the lunch or dinner menu of most restaurants, I knew this was the destination for a Road Trips For Food. Walking into Icebox Cafe, I felt like I found a place made just for me. There are three showcases and they are all filled with more than 30 beautiful desserts. All eight of us ordered lunch, but quite frankly, it was for the purpose of justifying the nine desserts we were about to consume. The lunch was good, but my focus was strictly on dessert. Icebox Cafe makes their own ice cream cakes, of which we tried two of the twelve displayed. Both the Mint Chocolate Chip Ice Cream Cake and Peanut Butter Ice Cream Cake were delicious with alternating layers of ice cream and extremely moist chocolate cake. The counters are lined with a selection of bagged cookies and bars. I felt that we had to try at least one cookie and one bar. The Chocolate Chip Cookie was good, although a tad doughier than I prefer. The Dream Bar was like the kitchen sink of brownies (lots and lots thrown in) and one of the quickest to be consumed. In terms of the cakes — WOW! We tried two chocolate cakes. The first was The Bomb, an Oprah favorite, consisting of layers of dark chocolate, creamy cheesecake brownie and chocolate mousse filling with a dark chocolate ganache. The second was the Devil Dog – three layers of chocolate cake topped with chocolate ganache and whipped cream. Both start with that fab moist chocolate cake and then it is simply deciding which one you are in the mood for. Fortunately for me, I was in the mood for both. We also tried two non-chocolate cakes; Almond-Pistachio Cake and Coconut Butter Cream Cake in addition to the Chocolate Cherry Bread Pudding. Everyone was sure that the chocolate cakes were going to be our favorite ones, but we were wrong. It would be a toss up choosing between the Almond-Pistachio Cake and Coconut Butter Cream Cake. Both were delectably moist and flavorful, as they both start with layers of cake that are moistened with a syrup that is appropriate for each. It is comforting to know that if you can only pick one of these two, you won’t go wrong either way. 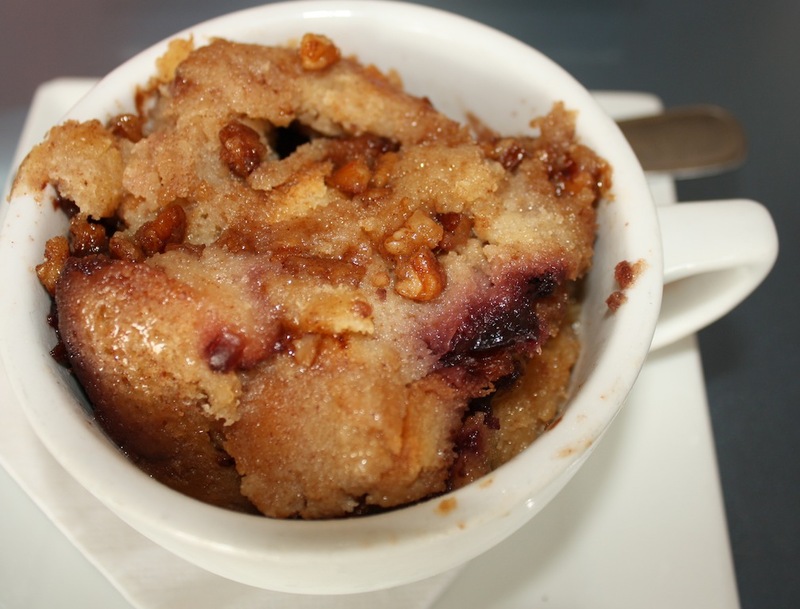 The bread pudding is made with Brioche bread, sour cherries, chocolate ganache and a praline topping, served warm in a coffee cup. When it first arrived I thought, “Wouldn’t a giant scoop of ice cream be lovely on top?” The chefs at Icebox Cafe know what they are doing; the dessert was perfect just the way it was presented. This was, hands down, the #1 choice at the table, which is quite the compliment for the bread pudding. We did stroll along Lincoln Road after lunch, and because the temperature was well over 90,000 degrees, I am pretty sure we worked off at least seven of the nine desserts we ordered. Even if this did not occur, I would not hesitate to head back down to Icebox Cafe. The desserts are worth the drive. Yummy ice cream cakes for the gluten free connaisseur :-), and as always great friends! Actually, lunch was very tasty too.